You are here: Home / By Room / Outdoor Home / 5 Ways to keep up your home’s curb appeal… even in the Winter! 5 Ways to keep up your home’s curb appeal… even in the Winter! 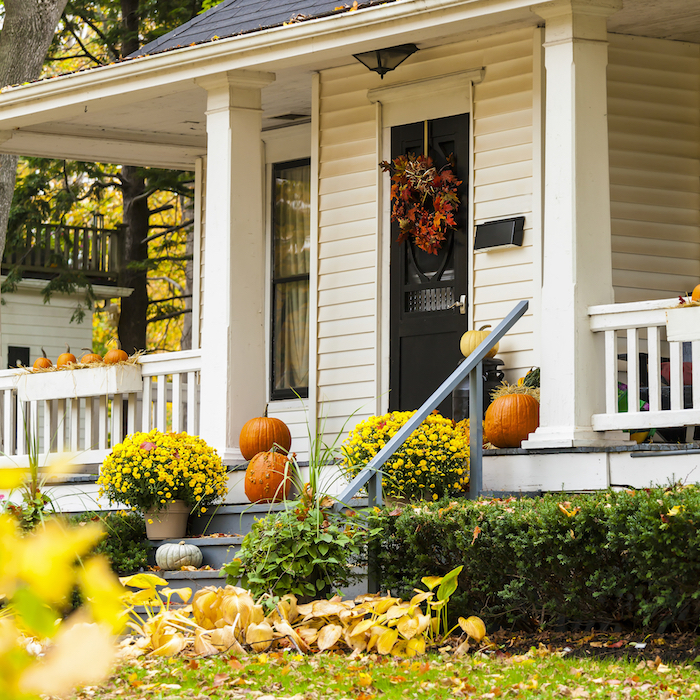 Have you looked at your curb appeal lately? If you have your home on the market, or you just want your home to keep it’s appeal from the street, Stagetecture can help. We tend to only focus on our landscaping when the sun is bright, grass is green, and the flowers are bountiful. Remember, in the Winter you still have guests, neighbors, and home buyers! Here’s 5 ways to keep up your winter curb appeal! 1.) Keep your lawn manicured for beautiful curb appeal: If you live in southern climates, where the grass is dormant, rake the leaves and debris often. If you live in a climate that the lawn is covered with snow the majority of the winter, consider winterizing your lawn before the season. During the snow periods, keep sidewalks and driveway shoveled, and free of debris. 2.) Curb appeal is all about color: After the holiday season, the lights come down and we’re left with yards that look brown and blah. Consider adding a colorful wreath, winter foliage, or even artificial flowers to a flower pot at the front entrance. Entrance doorways are a great place to add seasonal decorations and invite your guests into your cozy home. 3.) Landscaping still needs attention: In between the Winter storms, trim back hedges and prune trees before the Spring season. Rent a cherry picker to handle tall trees and pick up dead branches, and add mulch to the plant beds to keep moisture in, and frigid temperatures out. In climates that are warmer consider planting evergreen or winter plants. Wind up water hoses, and other lawn care items that won’t be utilized until Spring. 4.) Remember the lighting: Curb appeal is not only for the daytime, remember the evening hours! Make sure lighting is sufficient at the walkways, driveway, and front entrance leading to your home. In the Winter, especially in icy areas, lighting is about safety and aesthetics to your front door. Change burned out light bulbs, update old fixtures, and consider adding fixtures if there are dark areas. Landscaping lighting can be added to plants and exterior of home to add drama and ambiance. 5.) Exterior: Last of all, but most importantly make sure your home’s exterior is kept looking fresh. Repair any sagging gutters, chipping paint, and roof shingles that are missing or loose. Fix or paint fences, and paint or stain if they look worn and aged. If trying to sell your house, remember the lawn gets the guests to the front door, but ultimately the house is what they are there to see. Make it shine, and give guests a welcome surprise from the bitter outdoors! « Brrr… keep the cold out of your house, and money in your wallet! Hi Marilyn, Thanks for the great feedback! I'm wondering if your connection is slow on your computer. On my laptop, and on my iphone the pictures came right up. There was no loading time. I appreciate your comments, and invite you to check back regularly, or subscribe to the blog! Have a good day. Not sure what the others were talking about, I had no problem with a quick download of your pictures. I do have an advanced computer, so maybe they have slower models. Although some of your suggestions seem obvious, I think many people often miss thinking of all the things that seem obvious to others. Those of course are the ones that your suggestions will most help. I found it helpful to go through your list of suggestions to be sure I did not miss anything. Thanks for the advice. I think that's what people don't realize, is that the obvious is what sells homes. The obvious although, always seems to miss people and they need a checklist of items to make them realize, "oh yeah, I should have known that!!" Stagetecture helps us keep organized, and on the way to a beautiful home, indoors and out! Great items altogether, you recently gained a new brand brand new readers. What could you would suggest with regards to your post that you just built at times during the past? Every certain?